I chose to watch this before Usagi Drop this week, and I was pleasantly surprised at how good this episode was. This anime is slowly climbing the ladder for me! I don't even know how to comment. 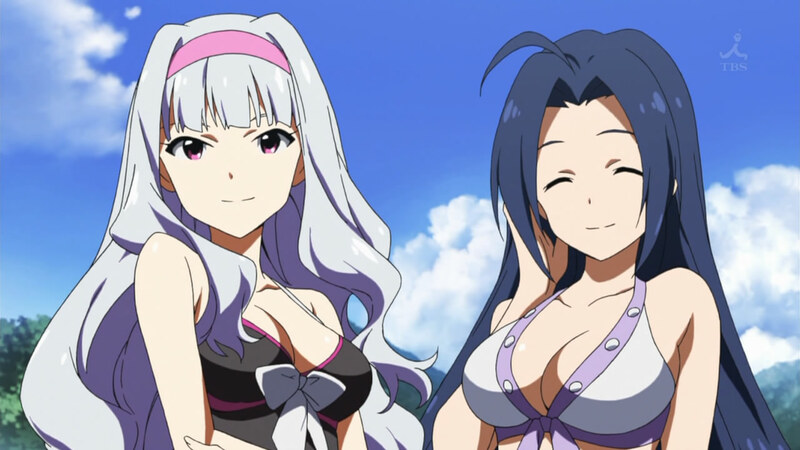 This episode, as the preview suggested, was a typical beach episode. I was eager to know who the focus would be for the week, and was startled to see that there was no singular focus; rather, the episode was more about the entire cast of idols, more or less. 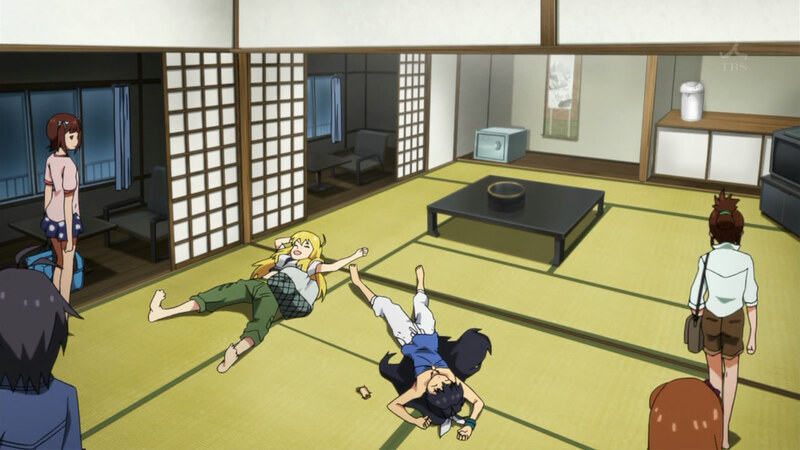 I'm glad that an episode like this was thrown in; it's good to see the girls interacting with each other to set up the environment a little better. While the recurring story from last week (Chihaya's sadness) was not fully resolved, I was pleased that it was gently touched on (in the form of Haruka comforting her). The story development is going quite well so far. Even at the beach, I was carefully watching to see who would become the main character. I had thought it might potentially be Ami and Mami (although I recognize the follies of not focusing on them separately, they seem as one unit for now), but as the episode continued it seemed as though there wouldn't be a focus. Because of that, the format of the episode felt very different - basically, it felt longer. There were lots of little scenes, showing the girls doing various things, and so it felt like more ground was being covered. I'm glad to see that there aren't steadfast cliques within the idols; the girls had no problem hanging out with different people, although I'm sure there are certain ones that are closer. 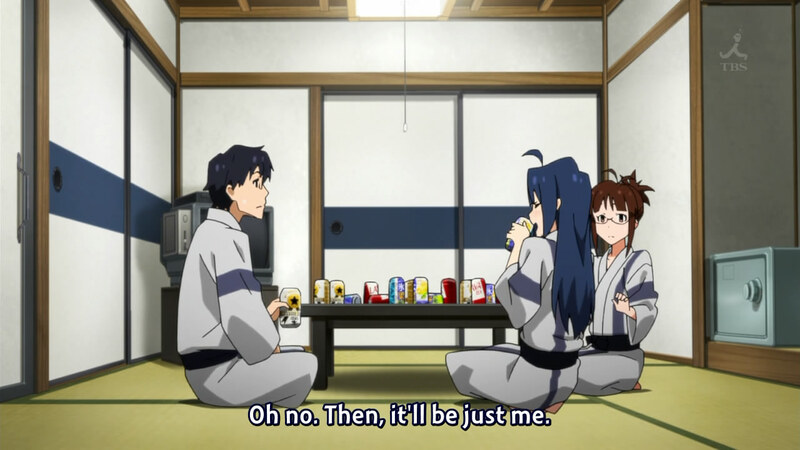 Chihaya, probably due to her residual ennui from the previous episode, got a little bit more limelight. She didn't seem too excited to be at the beach, staying under the umbrella and reading a book while the others frolicked and played around. Haruka made it her mission to get her out of her shell (whether or not she knew about what was causing her sadness, at first), and nearly forced the girl to go swimming with her. That did seem to do Chihaya some good, as she mellowed out a little by the end of the episode, but I still wonder about her state of mind. Her comment that she probably wasn't getting singing jobs because she lacked talent made me extremely concerned; very rarely in life do those with talent immediately rocket to prominence. A lot about life is playing the game and getting yourself out there. The reason behind her lack of singing jobs (assuming she doesn't lack talent, per se) has to do with time and presentation; she might not have been thrust into the world properly or enough yet (something Producer shares the blame in). Chihaya needs to learn that the industry is not something she can depend solely on her talent for, and also to not get so disheartened with little setbacks. Thin and can put away food. I want. The long day of swimming at the beach was segmented with lots and lots of scenes (and an insert song sung by the entire group, I'm guessing). 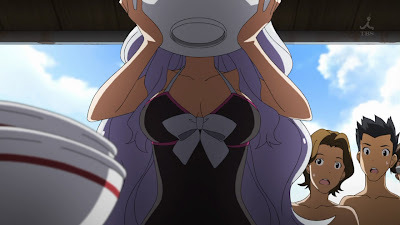 Hibiki and Makoto kept having swimming races, Yukiho dug and dug and dug, Takane wowed spectators with her incredibly gluttonous stomach (in a ramen-eating challenge), and Miki "thwarted" the boys that hit on her by accepting their free food but sending them off to a race instead of readily spending time with them. The more I see of Takane, honestly, the more I want to see of her. Clear favouritism?! 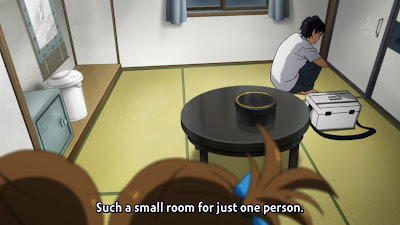 That's a pretty large room. After sunset, the girls headed over to their lodgings for the night, a homely Japanese inn. Although they commented that they didn't have the money to stay at a ritzy place, I have to note that the inn didn't look too bad. I mean, it looked a little "shabby" on the outside, but I'd say that that's "old world charm", since it was spacious and clean inside. I suppose it was the idea that all of the women would be staying in one (large) room together... Either way, the fun continued as the girls settled in and then got ready for the open-air bath. I'm reminded of Tatami Galaxy. Ah, I know all too well what it's like to be the only man in an all-girl situation. Some mildly concerning memories aside, it was interesting and amusing to see that Hamzou was placed with Producer for bathing; I mean, I knew that the hamster was a boy (or, rather, I had assumed), but to even send him to the men's side for bathing... Miki showed her charm once again by almost flashing Producer after she walked into the wrong side of the bath; seriously, she's the epitome of a jail-bait. 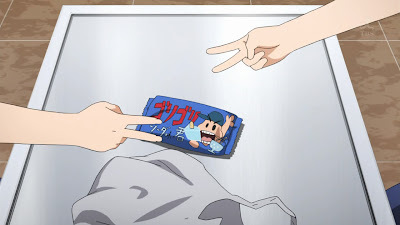 After the bath, the girls played ping pong while Yukiho realized that she had forgotten her cell phone on the beach, causing the trio (consisting of Iori, Makoto and her) to head back out to get it. 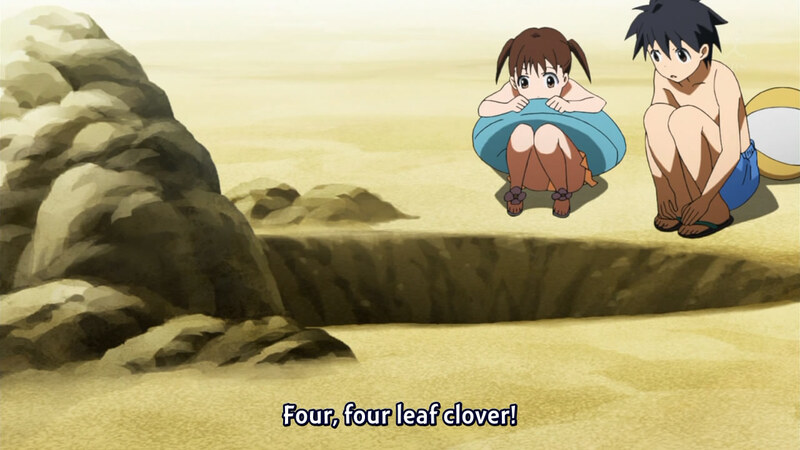 (I do wonder how come no one just took it, considering it didn't look like it was buried in the sand or anything.) Chihaya and Haruka sat by the window, and it seemed as though Chihaya was finally at some stage of relaxation, as she stated that it didn't feel bad to sit by the window and hear the waves. Later that night, while too excited to sleep, Haruka, Chihaya and Makoto fantasized about where they would be in a year's time, giggling about the potential of becoming huge stars. Iori brought them back to reality, on some level, by commenting that she was worried about Producer and the future of the company. Any time that something serious and real like that is said, I really like this anime more. It's true that the way Producer has been thus far isn't a good sign, and I'm glad that not everyone is simply believing in the future without any reservations. Ryuuguu Komachi! ...what does that mean? 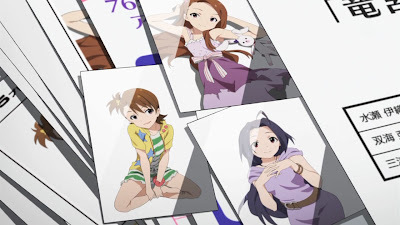 Upon returning to the office (and a fixed AC), the president came in and formally introduced the topic that had been floating around in various scenes in the entire episode - the group that Ritsuko had been urgently pushing, Ryuuguu Komachi, had been officially formed. (Previously, Kotori had gotten a call from the president about it and had called Ritsuko while she accompanied Asuka and Producer to their drinking.) It's highly interesting to see that the side group consists of Iori, Asuka, and only Ami. What about Mami? I'm curious to see if they'll pull the age-old "twins acting as one" trick, where twins play one character (considering idols are often actually characterizations), or if perhaps this is an attempt to get the twins attention on their own. I foresee potential problems in their future, as they seem so close currently that they even think alike (which is why the rock-paper-scissors earlier did not go so well) and now they're getting "split up". Lastly, I wonder what the impact of a side group being created will be on the rest of the idols; if only the trio begin doing well, surely it won't cause only happiness for all. All in all, it was a pretty good episode. Seeing all the girls together was a nice break after Chihaya's emotional end last week, and the good news at the end of this episode made me very excited to see how this group fares. I had once worried that this anime would be too light-hearted and wouldn't touch on "serious" matters about the entertainment industry, but it seems as though its agenda incorporates reality along with cute scenes. That's always a treat.